If you’ve got a pirate fan in your family, you’ll want to listen this week! We give you the low down on all the pirate activities and fun you can find at Walt Disney World. At the other end of the spectrum, you can find where we discussed how to have a Perfect Princess Day back on Episode 88. Join us this week as we continue our In Depth series, this time with the Caribbean Beach Resort. We talk about all the features of this resort including amenities, restaurants, room types, pools, and pricing. With the long-awaited reopening of the Pirates of the Caribbean ride at Walt Disney World’s Magic Kingdom I started thinking about all the fun stuff a pirate fan can do there! If you’re into pirates here is how you can enjoy a perfectly pirate day. First up you’ll need to dress the part! 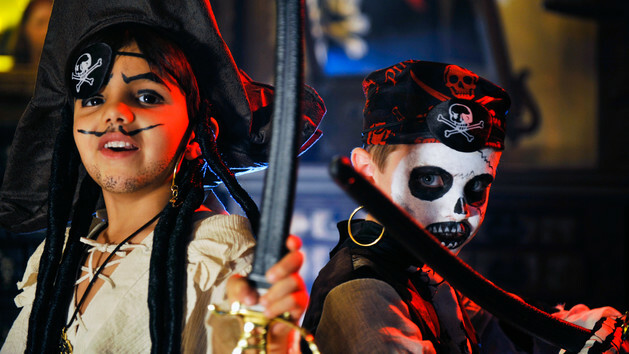 At Pirate’s League you’ll undergo a pirate makeover including face paint, an earring, an eyepatch, bandana, sword and more! You’ll also be given an official pirate name and instruction on how to talk (and walk!) like a pirate. 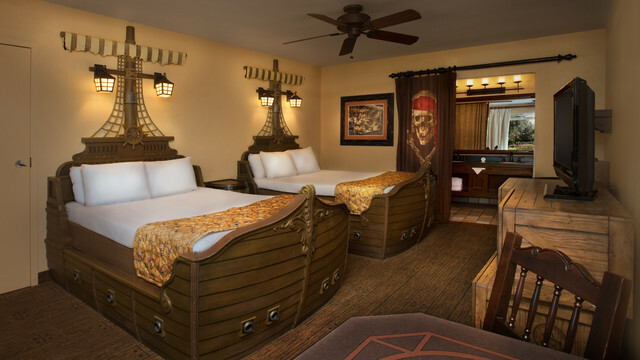 Unlike the Bibbidi Bobbidi Boutique, Pirate’s League welcomes adult guests as well as children over the age of 3. Packages range from $34.95 to $79.95. Next up (and maybe most importantly!) is a visit to the newly refurbished Pirate’s of the Caribbean ride. This quintessential pirate experience spawned a movie series and is a must do for any pirate fan. In fact, the 5th film in this franchise is due in 2017. Yo ho, Yo ho! For a fun interactive pirate experience you should try A Pirate’s Adventure ~ Treasures of the Seven Seas. This treasure hunt features five different quests (with 3-5 stops on each quest) and you can choose to do just one, all five or any number in between. You’ll follow a paper map to lead you to a treasure, and if you find 5 you’ll be welcomed in to Captain Jack’s crew! Each quest takes about 15 minutes and can be done at your leisure. A Pirate’s Adventure is a lot of fun, and a nice change of pace from the regular rides. A must do! Captain Jack Sparrow’s Pirate Tutorial is a show that features volunteers who would like to learn the art of sword fighting and other pirate-y arts. Be sure to check the Times Guide so you don’t miss your opportunity! Catch a video of the performance here on YouTube. Want to catch a glimpse of another famous pirate? Take a ride on Peter Pan’s Flight where you’ll see Captain Hook in all his glory! A great way to cap off your pirate filled day is actually located just outside the Magic Kingdom on the Seven Seas Lagoon. Departing from the Contemporary Resort is a very special Pirates and Pals Fireworks Voyage featuring a visit from Captain Hook and Smee. The cost is $69 for adults and $41 for children (at time of this blog’s publication) and features drinks and snacks on this cruise navigated by your pirate captain Patch. Featuring tall tales and sea shanties your journey will be capped off with a view of the Wishes fireworks show that is rivaled by little else. Weather permitting you’ll also be able to see the Electrical Water Pageant. The voyage is topped off by a visit from a special secret guest. What a way to end your perfectly pirate day!